Rep. Diana Gonzalez (P/D-Winooski) talks up a carbon tax proposal Monday in Winooski with members of 350.org. It’s been a tough legislative session for Vermont progressives, big ‘P’ and small. Many of them would prefer to shift a greater portion of the tax burden to the wealthy while sparing budget cuts to state programs. They’d also like to see more focus on climate change. But with federal budget cuts looming, they’ve been swallowing hard and going along with a more conservative approach to state spending. On Monday, four Vermont House members made polite, tentative steps toward maybe eventually advancing progressive policies that would tackle both taxation and climate change. Perhaps next year — or just sometime. The four lawmakers chose to go about announcing their ideas in an unusual — arguably awkward — way. They held four separate press conferences at four different locations around the state and invited certain media members to each without telling any of them about the other events. The end result for any dutiful Vermont consumer of news will likely be confusion. One TV station will be talking about a carbon tax while the next will be airing footage on a sales tax proposal. All these ideas, which backers concede are nowhere near ready for passage this year, will be competing with each other. They represent four different ways of shifting existing taxes toward a tax on fossil fuel usage. Copeland Hanzas proposed reducing the state’s 6 percent sales tax by 1 percent each year while phasing in an equivalent tax on home heating oil, propane and gasoline. Such a move would help downtown Vermont businesses compete with sales tax-less stores in New Hampshire and online, she said, while giving Vermonters incentive to reduce their use of fossil fuels. Reps. Martin LaLonde (D-South Burlington) and Johannah Donovan (D-Burlington) each issued different proposals focused on shifting property or income taxes. 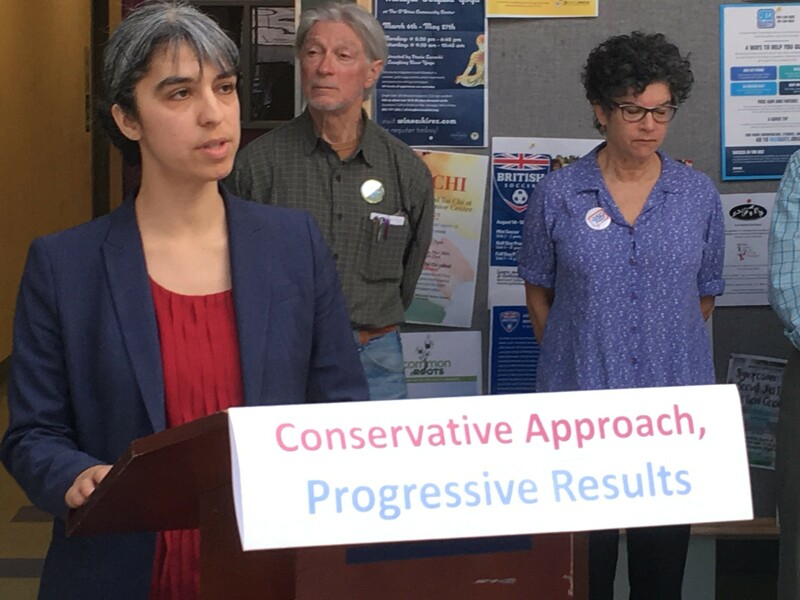 Rep. Diana Gonzalez (P/D-Winooski), in her home district and flanked by organizers with the environmental group 350.org, touted a different approach to taxing fossil fuels. She would have Vermonters pay a tax on fuels, with the state collecting the money and returning it in the form of quarterly dividends based on one’s income. Low-income Vermonters would get a higher return than wealthy residents. The exact details, she said, would be worked out through debate. The idea, Gonzalez said, is based on “The Conservative Case for Carbon Dividends” proposal released earlier this year by former aides to Republican presidents Ronald Reagan, George H.W. Bush and George Bush. Gonzalez said she wants to have a productive debate on the issue after a disastrous attempt in 2015. Back then, legislators pulled a carbon tax proposal almost as soon as it was launched after outcry that it would raise the cost of a gallon of gas. Long after the idea had been dropped, Republicans continued to use it as campaign fodder. So far, the conversation doesn’t seem to have shifted much. Vermont Republican Party executive director Jeff Bartley blasted the idea of charging Vermonters more for fuel, particularly hitting Gonzalez’s plan.